Dan Dainton never really needed any encouragement to stray when it came to recipe development; even his core range seems to be in a constant state of flux. 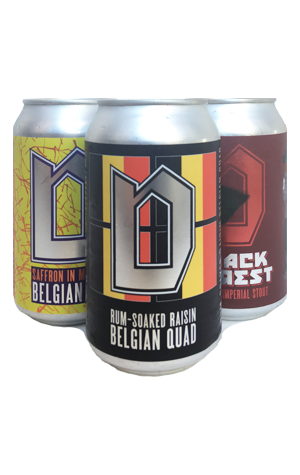 But, presumably, taking out Champion Beer at the Craft Beer Awards for the Cherrywood Smoked Rye Baltic Porter offered encouragement to continue nudging the envelope, as with this trio of recent one-off releases. A first waft of Black Forest was enough to disturb the part of the Crafty brain storing recollections of wine. Which is just as well as the beer – an imperial stout fermented on Red Hill cherries and created with Clare Valley Brewing Co – spent time in Kooyong Estate French oak barrels. The cherries contribute a fruity tang that helps lighten the impact of the hefty malt and booze bill (11 percent ABV), while contributing something a little extra atop the dark chocolate and roasted barley typical of the style. NB: Just 500 numbered cans featuring artwork by Ace Volkov. The Rum-Soaked Raisin Belgian Quad is another beast, tipping the scales at a not inconsiderable 11.2 percent ABV although lighter on its feet across the palate than one might expect. It's best to leave it to warm as that's when the sweet, rummy, boozy characteristics – raisins, Christmas spices, treacle – come forth, joining the toasted toffee like malts that lend the beer its blood orange/amber hue. The last of this current trio (and also the one that's been out the longest so get in quick if you like the sound of it) is perhaps the most bonkers of them all. There's a Belgian ale yeast delivering fruity esters and peppery spices within the Saffron In My Rye Belgian IPA, while the hops add a drying bitterness. So far, so normal. it's the last piece of the jigsaw, however, that sets it apart. The brewers added saffron, apparently in the hope of turning the beer a bold orange. What they got instead was a yellow of such glowing, vibrant and effusive nature it feels like a warning. Still, three days on from sampling one we're still standing so can assume it's safe for human consumption.